The biggest problem with our education system (at least in my country) is that it stifles wonder and creativity instead of encouraging them. Trying to teach people in an environment where learning is discouraged is clearly self-defeating. 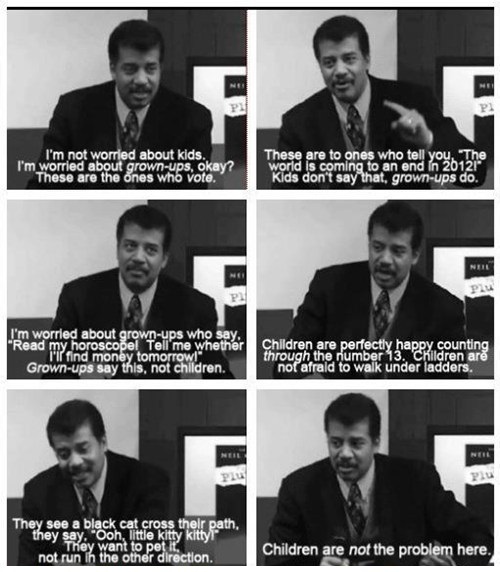 Thank you Mr. Tyson, for being almost like a celebrity. That means there is finally a way to get science into popular culture. 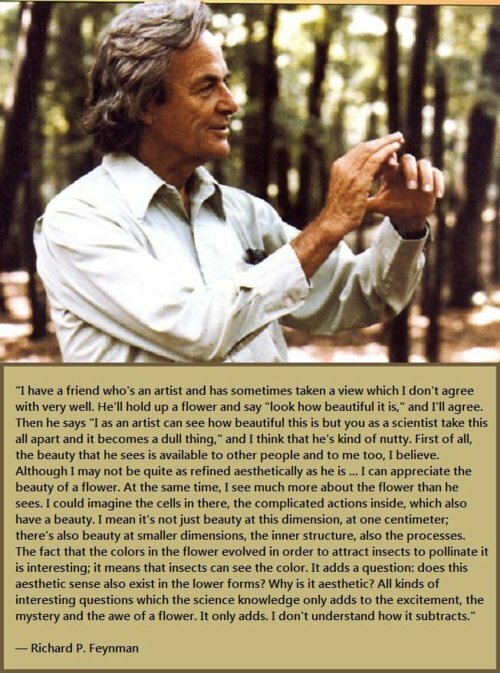 Tyson, Sagan, and Feynman -- my top three science heroes. One of my favorites as well. Understanding the rules and processes that govern all of reality literally changes the way you see everything. Everywhere you look you see atoms and photons and chemical interactions and physical forces. It makes every small thing seem so grand and wonderful. I would challenge any of those people to name one piece of the "scientific" evidence they keep talking about that supports their claims. It would be interesting to see what they would make up, although it would most likely degrade my faith in humanity even more. Most likely it would be some sort of subjective experience argued as evidence due to a misunderstanding of what actual evidence is. 70000 sq ft of stupidity, 18 prisoners and millions of deluded pawns. That just about sums up this video and organized religion. Although the people at the end of the video were an exception. I feel bad for them. They just don't know any better. In their world chance and randomness do not exist, and anything that remotely has some kind apparent randomness is necessarily false. So in the case of evolution they will hear that genetic mutation is pretty random, and they will conclude that evolution means that all life that we can see today happened "by chance". They can prove that this is false by putting some chemicals and water into a box, and if it hasn't turned into an elephant, emu or poodle overnight "by chance", evolution must be wrong. If pressed for a better proof, they will simply refer to someone else who thinks evolution is wrong and has worked out the arguments for them. I want to think the world will move past this, and the number of creationists will dwindle (is that evolution I detect?) into nothing. I really, really want to think that, and in 60 years I'll be able to say to confused young adults that "yes, people actually believed in that crap! They literally thought it was true!" and recieve back expressions of disbelief. "Really? I mean- really? Seriously? You're just joking. I'm going to say, 'Ok' and your going to start laughing your head off." I'll just look back at them with a straight face and sigh. "At least it's over with." Will we have creationists in six decades? I believe one day religion will indeed be something of our past. But it won't come soon enough for us to see it. In a few centuries or millennia at the best. Remember, we're still a type zero civilization. Type 1 is nearing though.